Maria Palazzo* was 5 years old when she began experiencing dramatic mood swings. Her mother said they came out of nowhere without any identifiable precipitating event. “They made no sense to me,” her mother said. Maria had been an easy infant, but when she started eating, she got fussy. The fussiness progressed into a full-blown mood disorder before the cause was attributed to celiac disease. Celiac disease is a common genetic autoimmune disorder that affects children and adults and may be diagnosed at any stage of life. People with celiac do not adequately digest gluten, the protein in wheat, barley, and rye. When gluten is consumed, the individual faces myriad symptoms due to malabsorption. The villi, the little hairlike protrusions that line one’s duodenum, become dull. They are no longer able to absorb the nutrients from food. As a result, any number of symptoms may occur, including those affecting mental health. The only treatment for celiac disease is to remove gluten from the diet. Once thought to be quite rare, it is now known that celiac disease affects 1% of the U.S. population. The medical community does not easily identify people with the disease, and it takes an average of 10 years for proper diagnosis. Physicians used to be taught that celiac disease was an orphan disease with only a few individuals affected by it. Current research shows that one of every 133 people has the disorder (Fasano et al, 2003), but only 5% of those affected know it, according to 2008 information from the National Institutes of Health. Challenging the diagnosis of celiac disease are the varied symptoms and a lack of medical awareness (Zipser, Farid, Baisch, Patel, & Patel, 2005). To demonstrate how the disease’s presentation confounds diagnosis, one must only explore how the symptoms are described. Typical symptoms, including diarrhea, gas, and bloating, occur in less than one half of all newly diagnosed cases. Atypical symptoms occur in the majority of those newly identified cases (Rostami Nejad et al, 2009). These presentations include anemia, fatigue, osteoporosis, other gastrointestinal complaints, and even depression and anxiety. Many people with celiac disease are referred to a behavioral health professional. They may be experiencing emotional pain due to infertility or chronic fatigue syndrome. Or maybe their primary care provider couldn’t figure out what was wrong and suggested the cause was “in their head.” Considering celiac disease is critical to recognizing a person who has been misdiagnosed. 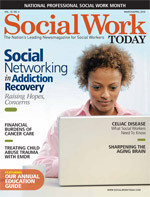 Social workers can partner with other healthcare providers to accomplish this. Teri Heines, MSW, LCSW, PsyD, who is based in Greenwood, CO, says when Maria was diagnosed with celiac and gluten was removed from her diet, her behavioral issues improved. Now 8 years old, Maria’s mood swings are attributed to her diet. The behavior changes Heines observed when celiac disease was recognized and treated inspired her to learn how to spot it in her clients and promote awareness of the disease among her colleagues. The National Foundation for Celiac Awareness’ (NFCA) mission is to raise awareness of celiac disease and gluten intolerance that will facilitate research, education, and early diagnosis, consequently improving the quality of life for people with this autoimmune disease. The nonprofit organization developed a comprehensive continuing medical education (CME) training program about celiac disease for healthcare providers to address the dearth of knowledge in the medical community. Its courses, offered collectively through Celiac CME Central, include Gluten-free Resource Education and Awareness Training (GREAT) Mental Health. The online learning module, accredited by the National Association of Social Workers, informs the learner to recognize undiagnosed cases of celiac and offers resources so clinicians are equipped to support the diagnosed person struggling with a gluten-free diet. Heines took the NFCA’s GREAT Mental Health CME course and found it increased her understanding of celiac disease and gave her a solid foundation to help her clients identify the possible source of their issues. She says, “I feel confident in my ability to support my clients with celiac disease and help them successfully handle the emotional challenges of a gluten-free diet.” She has referred a few of her own clients for testing with their primary care physician. To identify the 2.8 million Americans who have celiac disease but don’t know it, a multidisciplinary approach is needed first to recognize the possible symptoms and then to refer patients to their primary care physician for testing. Screening is conducted by a blood test. If the test is positive, or if there remains a strong suspicion of celiac even with a negative serology, a gastroenterologist must perform an upper endoscopy. This is a procedure done under sedation in which the physician takes biopsies of the upper part of the intestines (duodenum). The person must consume the equivalent of four to six slices of bread every day for the previous four to six weeks. If an insufficient amount of gluten is eaten, then the testing (both the serology and the biopsy) may result in a false negative. Eating disorders may coexist with celiac disease or even be incorrectly blamed for behavior. When we think about how eating gluten affects someone with celiac disease, it makes sense: Eating gluten can make a person with celiac disease feel ill and create an aversion to eating. Compounding matters, it is thought that the food restriction required in the treatment of celiac disease may contribute to the psychological features of an eating disorder (Yucel, Ozbey, Demir, Polat, & Yager, 2006). The need for a greater understanding of the intricacies of celiac disease and its management can be observed in the case of Pennsylvania resident Jennifer Steele. Jennifer was diagnosed with celiac disease when she was 13 years old. Her symptoms were depression and anxiety, which mostly resolved after she embraced a gluten-free diet. Jennifer’s mother, Suzanne, says her daughter was already being treated for an eating disorder when she went on a school trip to Boston at the age of 17. Although Suzanne Steele made arrangements for gluten-free food ahead of time, there was an error. Once hospitalized, the foodservice staff served her a wheat bun with a burger, and Jennifer’s sense of security declined more. Unfortunately, her assigned social worker failed to recognize the effect of the gluten in her diet and simply said that she’d need to learn to deal with situations like this. “It was a really hard time. Sometimes I regret going [to the hospital],” Jennifer says. Following discharge, Jennifer and her family worked with a social worker who provided in-home counseling, focusing on the family’s strengths. Jennifer says the social worker helped her appreciate her parents and how their support was needed for her success. “It is a family disease. Everyone needs to work together. It makes the family closer,” she says. The treatment for celiac disease is a gluten-free diet. Gluten can be found in many foods, beyond the obvious bread products and pasta. Many soups, gravies, even soy sauce and imitation crab meat contain gluten. Recent FDA requirements make label reading easier for the consumer, but diligence is still necessary. Tasty, ready-made products labeled as gluten free are also becoming more readily available as more people are diagnosed with the disease. In addition, many foods are naturally gluten free, including fruits, vegetables, and meats. Nonetheless, some people with celiac disease experience distress following their diagnosis. Feeling overwhelmed with the thought of eliminating wheat, barley, and rye from one’s diet is common. It typically takes a few months for someone to get accustomed to the intricacies of the new lifestyle and one year until it becomes second nature. But for some people, anxiety or depression take over. There may be fewer invitations to social events as friends and family either fear making an error during food preparation or consider the effort prohibitive. Emily Feiner, LCSW, who works for the VA and in private practice in Nyack, NY, describes celiac disease as a systemic disease. Accommodating a family member with a special diet demands that the family system changes, she explains. At Thanksgiving, stuffing the turkey with a substitute to the traditional bread stuffing is necessary to prevent contaminating the otherwise gluten-free bird. A rice or corn bread stuffing offers an alternative, and using a gluten-free bread works, too. Feiner describes work she did with a father and daughter who were both diagnosed with celiac disease but struggled to manage their diet. The pair didn’t take any measures to avoid feeling deprived with their new diet. To compensate, they justified the consumption of gluten on special occasions. The father thought he was being kind to his daughter by letting her have a treat with gluten. However, for those with celiac disease, the diet is very black and white: Just a little gluten can result in harm to the intestines. Although it does not pose the threat of an anaphylactic reaction like an allergy, repeated or prolonged exposure to gluten can lead to additional autoimmune disorders or cancers in addition to the likelihood of physical discomfort. Feiner used the situation with the father and his daughter to help them develop coping methods. She suggested that instead of permitting this harmful indulgence, the father bake gluten-free bread or cookies with his daughter as a way of showing that he cares. On a personal note, Feiner describes how her 12-year-old son, Jeremy, who is dealing with celiac disease, felt he was missing out by following a gluten-free diet after his diagnosis at 18 months of age. Feiner applied her social work skills to meet her son’s needs. At school, she supplied Jeremy’s teachers with a short pamphlet from the NFCA about supporting students with celiac disease (available at www.celiaccentral.org/Resources/Support-for-Patients/Celiac-Disease-in-Kids-Youth/Navigating-The-School-System/209). Involving the teachers helps them understand what celiac disease is and how the restricted diet may impact Jeremy emotionally. In addition, the school nurse kept gluten-free brownies in her freezer for impromptu celebrations, allowing Jeremy to enjoy a safe treat while his classmates ate theirs. Despite these accommodations, when Jeremy was about 6 years old, he asked his mother why he couldn’t have pizza on Pizza Day like the other kids. Feiner wondered, too, since there are gluten-free frozen pizzas available. Initially the school nurse heated up a gluten-free frozen pizza for Jeremy. But Jeremy still felt different; he wanted to eat his lunch from the same tray as the other kids. The school’s cafeteria supervisor refused to help. Fortunately her supervisor, a registered dietitian, understood the importance for Jeremy to fit in and soon he was eating gluten-free pizza on the same yellow tray as his peers. Food is an integral part of the American culture. It is important not just to sustain us but for the comfort it provides. We socialize and entertain over meals. In work settings, to encourage attendance at a meeting or conference, food is provided. What is a birthday celebration without cake? Whether in the community, a healthcare facility, or the private confines of a family gathering, advocacy is often necessary to implement substitutions or create simple solutions to support those following a restricted diet. Furthermore, people with celiac disease struggle to find behavioral health providers who understand the intricacies of the gluten-free diet. In response, the NFCA has developed the Gluten-Free Yellow Pages (www.glutenfreeyellowpages.com). Social workers who successfully complete its GREAT Mental Health training receive a free annual listing in the yellow pages. Through this listing consumers will be able to find providers and facilities that have the knowledge to satisfactorily meet their needs. — Loretta Jay, MA, is the director for program development at the National Foundation for Celiac Awareness (www.celiaccentral.org). *Pseudonyms are used throughout this article to maintain client confidentiality. Fasano, A., Berti, I., Gerarduzzi, T., et al. (2003). Prevalence of celiac disease in at-risk and not-at-risk groups in the United States: A large multicenter study. Archives of Internal Medicine, 163(3), 286-292. Rostami Nejad, M., Rostami, K., Pourhoseingholi, M. A., et al. (2009). Atypical presentation is dominant and typical for coeliac disease. Journal of Gastrointestinal and Liver Diseases, 18(3), 285-291. Yucel, B., Ozbey, N., Demir, K., Polat, A., & Yager, J. (2006). Eating disorders and celiac disease: A case report. International Journal of Eating Disorders, 39(6), 530-532. Zipser, R. D., Farid, M., Baisch, D., Patel, B., & Patel, D. (2005). Physician awareness of celiac disease: A need for further education. Journal of General Internal Medicine, 20(7), 644-646.